Some applications use a series of ports that change each time the application is used. 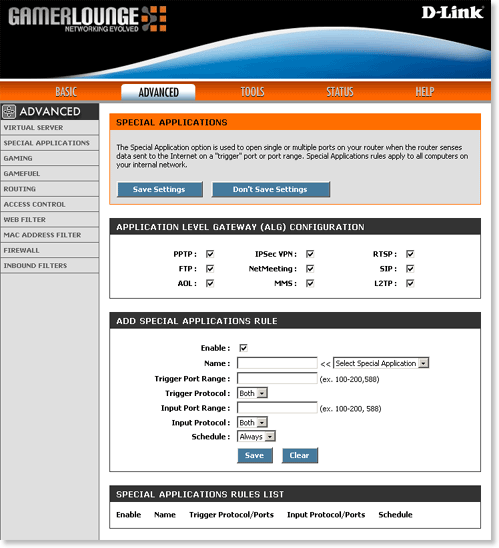 Special Applications will open all ports for an application when a port is triggered. Step 1: Open a web browser and type the IP address of the gaming router in the address bar (default is 192.168.0.1). Press Enter. Step 3 Click Advanced at the top and then click Special Applications on the left side. Step 4 Pre-defined applications will be listed in the Application Level Gateway (ALG) Configuration section. To disable any of the pre-defined applications, uncheck them. Name – Enter a name to identify the rule or select a rule using the drop-down list to the right. Trigger Port Range – Enter the port or a range of ports that will trigger the rule. Protocol – Select the protocol (TCP, UDP, or Both). Input Port Range – Enter the LAN port or range of ports. Input Protocol – Select the protocol for the LAN interface (TCP, UDP, or Both). Step 5 Click Save to apply the new settings.